No one really knew what to expect from Chickenfoot. The lineup is undeniably amazing and most people will have no idea what they're getting into when first listening to Chickenfoot 's self-titled debut. What is here is pure hard rock with a funky twist. Picking any song at random, a listener will be able to find something to tap their foot to and enjoy. Guitar solos are amazing, although you'd expect nothing less from Joe Satriani. The rhythm section is tight as you can imagine and Michael Anthony is given some great bass lines. Also, Sammy Hagar is not exactly known for creating deep and thought provoking lyrics and this album is the same. They're not great but the lyrics do the job. 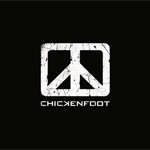 I'd expect an album that combines the talents of four incredibly different artists to sound disjointed and schizophrenic but Chickenfoot has made something good here. Not great, but good. The album is strung together by a few, very definitive riffs, and good ones at that. 'Avienda Revolucion' is a great example of that. It's heavy and bass and drums sound great. 'Soap on a Rope' is an extremely funky song with a great guitar solo. 'Oh Yeah', the band's first single, has a strong riff and the bass is amazing. After that however, 'Get It Up' sounds like a complete copy and paste of 'Avienda Revolucion'. Further along, every other song sounds a bit too similar to the first couple tracks and come off as filler. Overall, a fan of any of the member of Chickenfoot will most likely find something to like here. Anyone who appreciates hard rock with a bit of a funky flavor will like the album but I won't blame you if you feel bored after the first half of the album. Final word: give it a listen. Overall, a fan of any of the member of Chickenfoot will most likely find something to like here. Anyone who appreciates hard rock with a bit of a funky flavor will like the album but I won't blame you if you feel bored after the first half of the album.